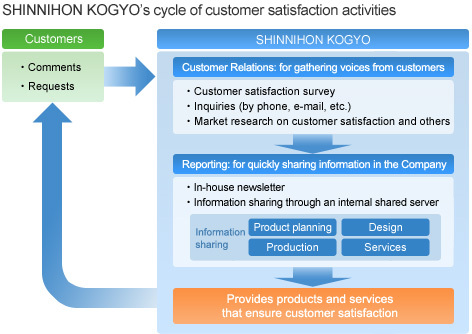 SHINNIHON KOGYO has set up a quality policy to provide products and services that ensure customer satisfaction on the basis of the customer-first principle. To evolve into a company that excels in manufacturing, the Company is united in its commitment to raising quality to unmatched levels. We are building a structure to ensure that quality is established for each item of equipment and process. The Education Committee is leading an initiative to develop our engineers in line with the principle that quality development commences with human resource development. We are committed to constantly improving quality and offering products that meet the expectations of customers. This is part of our constant pursuit of customer satisfaction. We will always seek customer satisfaction. We will continue to boost effectiveness of the quality management system. We will ensure that individual sections set quality targets, perform reviews and carry out improvement activities. We brief all personnel about the policy at general morning meetings and make the policy available for viewing by the entire company. We will review the quality policy at the time of the management review to ensure that it remains appropriate. SHINNIHON KOGYO has acquired the ISO 9001 certification. ISO 9001 is an international standard for quality management systems. Based on the customer-first principle, our ISO Office and quality control representatives make continuous efforts to improve our business operations. In the future, as a global business operator, we will be embarking on new actions to provide a consistent level of quality worldwide. We aim to be sensitive to customers' needs and to swiftly respond to them in the form of products and services. The customers' perspective is the starting point for all of our corporate activities. We strive to improve daily operations so that we can achieve customer satisfaction with our products and services. To provide customers with better products and services, we conduct questionnaires on a regular basis. The questionnaire asks about many different aspects of our products and services, including quality, delivery, costs and the attitudes of sales staff to gain insight into the impressions of customers. Customers' needs and complaints are made available on the internal shared server and the in-house newsletter to ensure that they are shared by all employees and that we will make comprehensive improvements to upgrade our products and services.